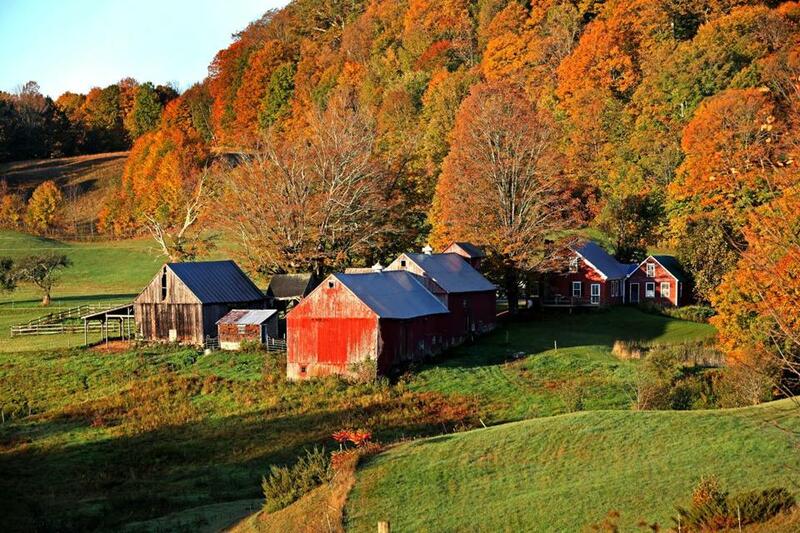 More than 50 years ago, a camera club discovered a small farm in Vermont that was postcard perfect during fall foliage season. Share your most stunning autumn photos with us on Instagram: Use the hashtag #GlobeFall. We’ll round up our favorites and share them on bostonglobe.com and @bostonglobelife next week. READING, Vt. — It was still more than an hour before sunrise, but Scott D’Amato had already unfolded his tripod and staked out a spot on the dirt road overlooking Jenne Farm. It was the third straight year that D’Amato had driven four hours from his home on Cape Cod to come to this spot, in this season, at this hour, and he knew that before the sun peeked over the horizon behind him, there would be many more tripod-toting photographers elbowing for prime positions. That’s because in the world of landscape photography, Jenne Farm becomes a sunrise mecca each autumn, a scene that so screams “quintessential New England fall” — rolling hills, weathered red barns, and an 18th-century farmhouse, all flanked by autumn leaves — that it has become, it is said, the most photographed farm in the country, perhaps the world. For the family that owns the 330-acre farm, the attention can sometimes be flattering and sometimes tedious. “But at this point, it’s just a normal part of our lives,” said John Morgan, one of the 10 family members who are part of the trust that owns the farm. (His mother’s maiden name was Jenne). In recent years, Morgan said, the crowds have grown thicker, more year-round — many try to shoot the farm in untouched snow — and more international, with a huge influx of tourists from Asia. But aside from the occasional over-aggressive elbow-jockeying and those seeking a bathroom, Morgan said, the vast majority of people are respectful and the family is happy to celebrate their postcard-perfect homestead. “We know it’s one of the most beautiful places in the world,” he said. There is a donation box at the top of the hill near a small parking area and a sign urging people to buy some homemade maple syrup (the main business of the farm, in addition to raising beef cows), but Morgan said that as long as the family owns the farm, the view will always be free and open to all who wish to see it. Back at the top of the hill, as the sun got closer to cresting the trees in the east, more and more photographers scrambled into position around Scott D’Amato. Expensive cameras were screwed onto tripods. Lenses were attached. Filters were cleaned. At 6:45, a trio of cars pulled in carrying members of a photo workshop led by a local teacher, Loren Fisher. The students moved quickly. Time was short. “Once that sun comes up this whole place is going to transform,” Fisher said. With everyone in position, the photographers grew silent and the show began. And, just as it has for decades, Jenne Farm did not disappoint. The story of how this once-anonymous farm became a photographic obsession goes back to the 1950s. The yellow leaves of the maple trees began to glow. The chipped red paint on the barns lit up like it had been plugged into a socket. And the cows, as if on cue, began to move into a better position for the photographers. The photographers were mostly silent, adjusting the settings on their cameras. The only noise was the opening and closing of shutters. It did not last long, this moment of light photographers call “the golden hour,” before the soft redness of the dawn light was washed away. “Did you get your shot?” someone called to D’Amato, who was folding up his tripod on the road. 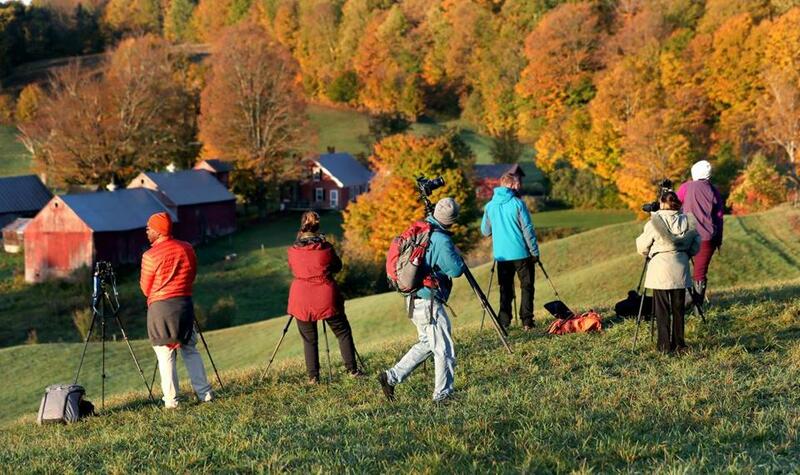 In the world of landscape photography, Jenne Farm becomes a sunrise mecca each autumn. Billy Baker can be reached at billybaker@globe.com. Follow him on Twitter @billy baker.